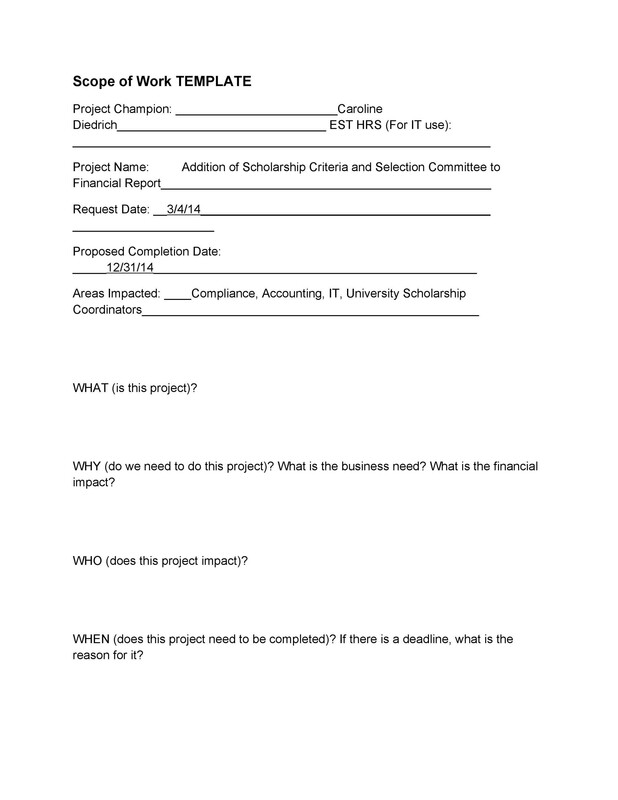 Writing a scope of work (SOW) project is an important part of doing business for many contractors, especially those that handle large-scale projects for other businesses. 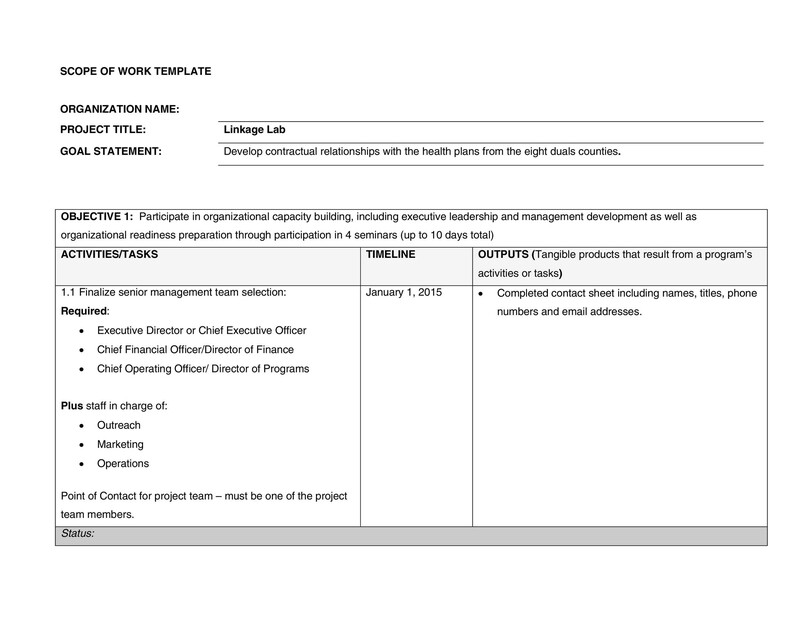 Your statement of work not only spells out specific phases and details for a project, it also helps tell the story of the work you plan to do. 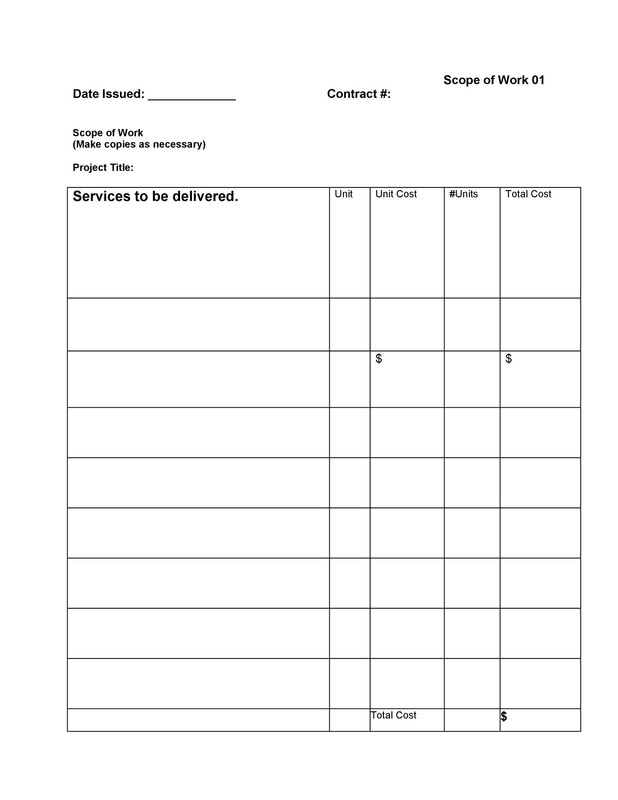 The scope of work your business plans to do will be spelled out in this document. 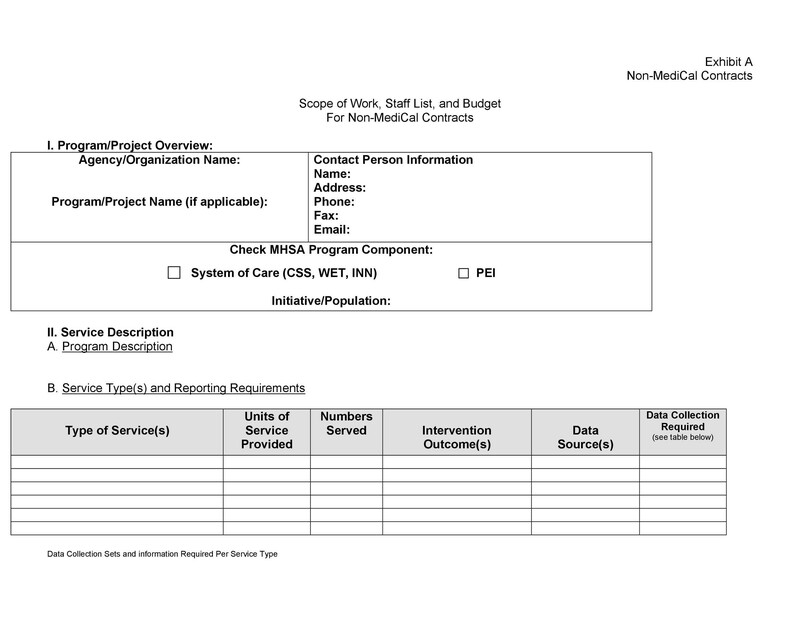 2 Why is a Scope of Work Document Important? 2.1 What Industries Use a Scope of Work? 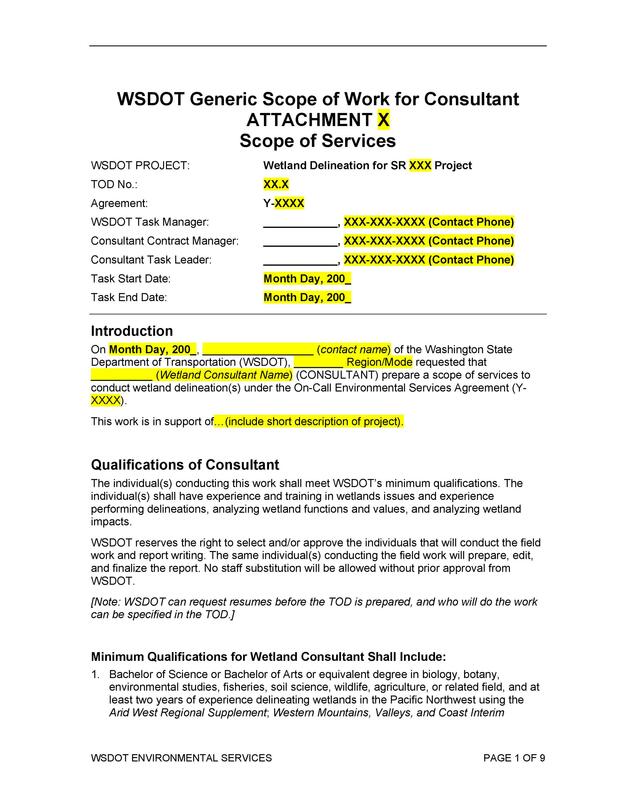 3.1 What’s Contained in a Scope Of Work? Sometimes, it’s important to define a document. 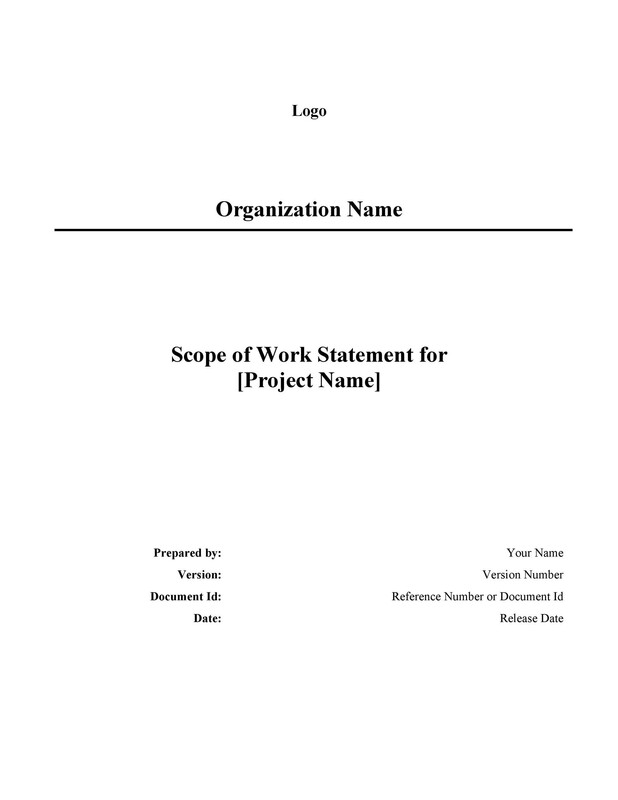 The Scope of Work document is sometimes called “statement of work” as well. 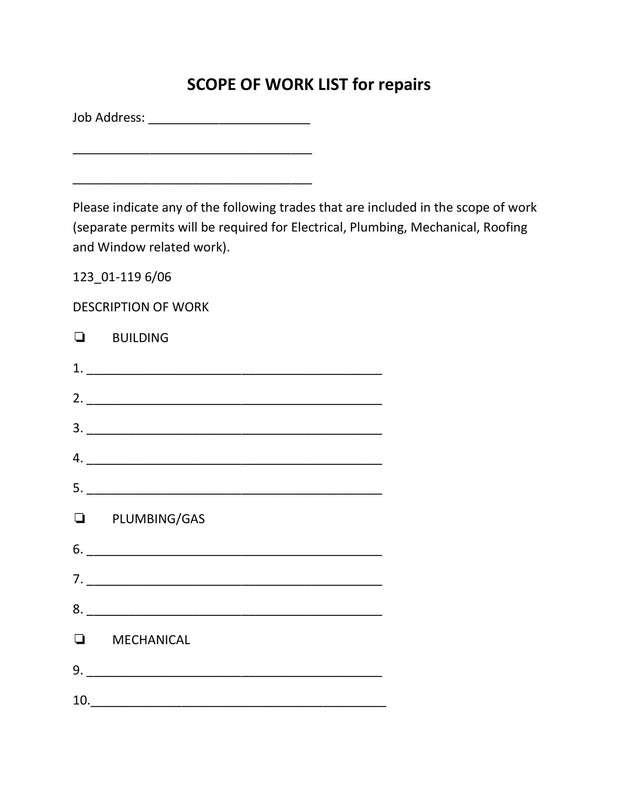 For this page, we will refer to the document as “scope of work” but please remember that you can use either of these interchangeably. 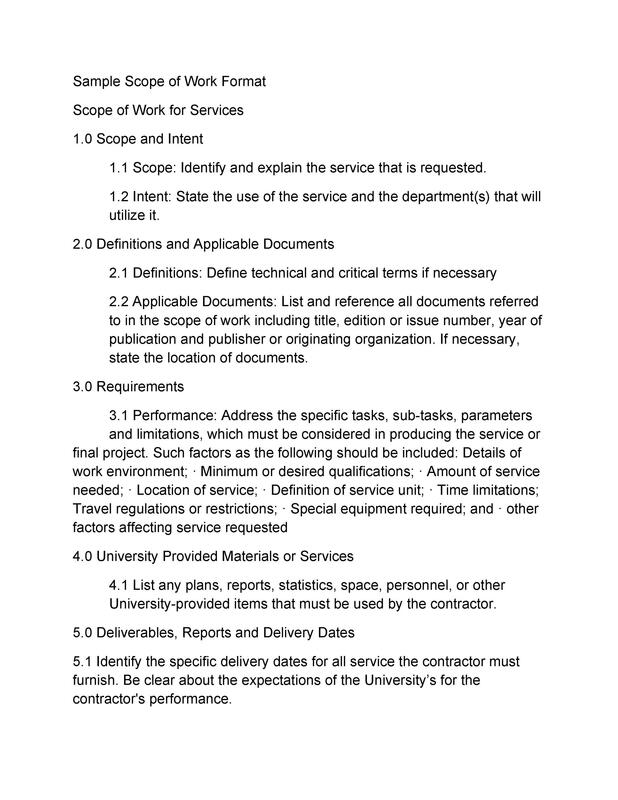 The SOW document serves as a contract or agreement contains information on how the work performed will be accomplishment. Inside the SOW, your content should explain any milestones, reports, deliverables, or other end products and results that your company will be completing. 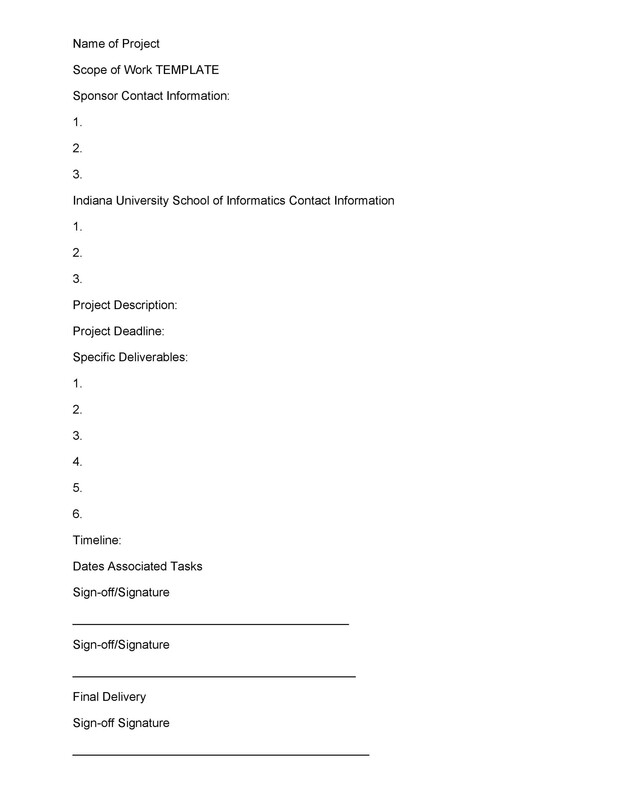 You should also include a timeline for each deliverable. 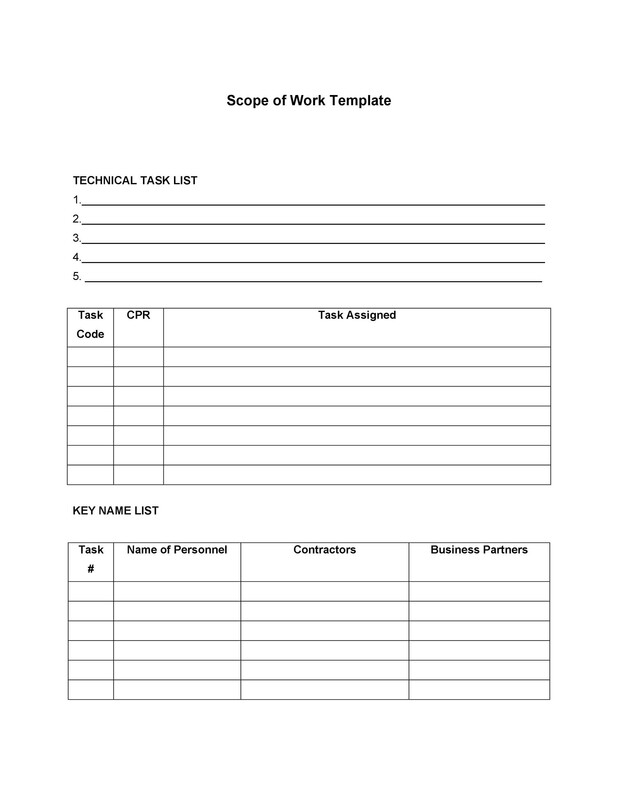 This page contains a Scope of Work template that you can download and customize. 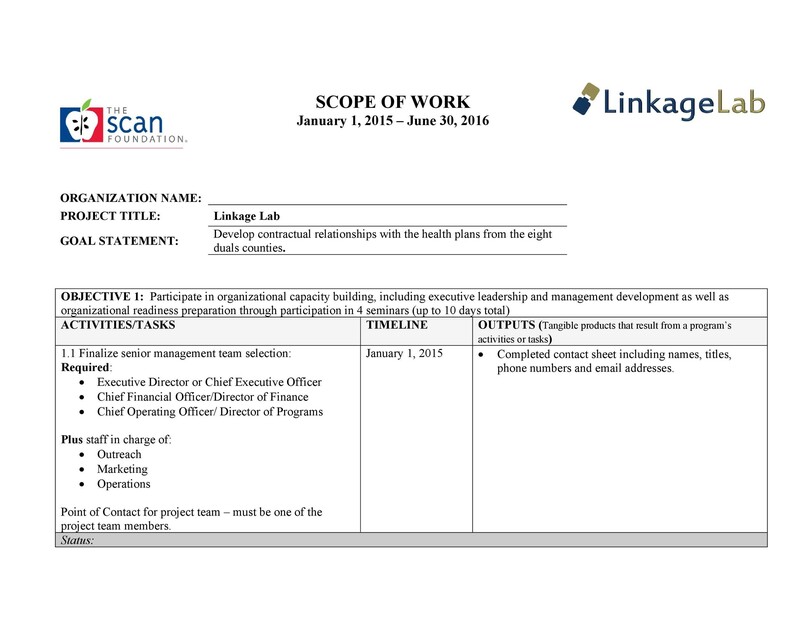 Why is a Scope of Work Document Important? 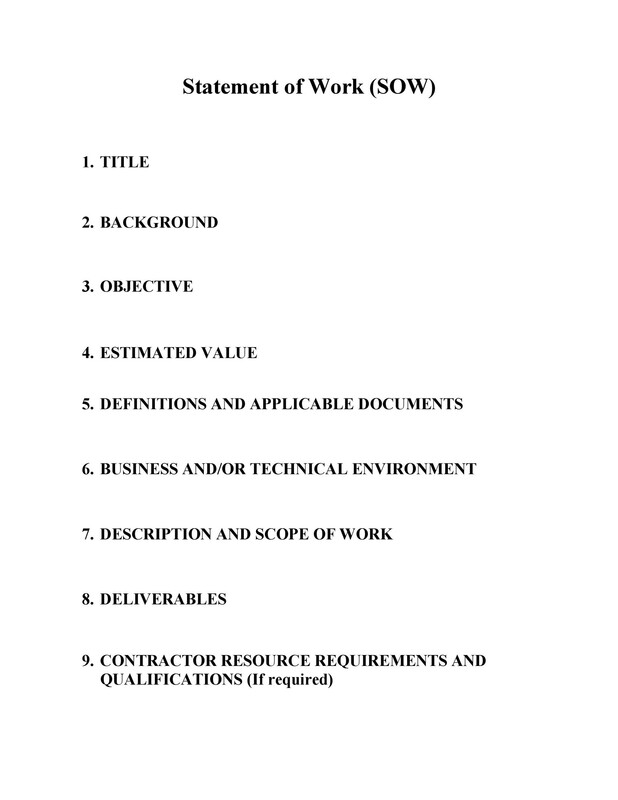 A scope of work document is an important thing to use if you’re a business that contracts with other businesses. If you sign contracts on a regular basis, the Scope of Work agreement helps you clearly define the terms of the project, no matter what industry you are in. 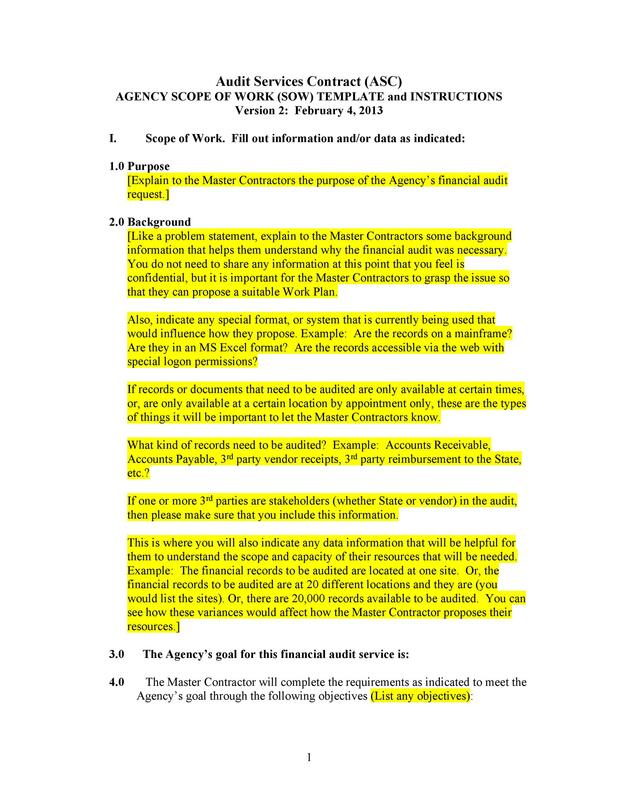 It serves as a formal document that describes the work to be done, the process of the activities, a timeline of deliverables, and payment terms. What Industries Use a Scope of Work? In the digital world, most companies that do business with other businesses assign each project a project manager. 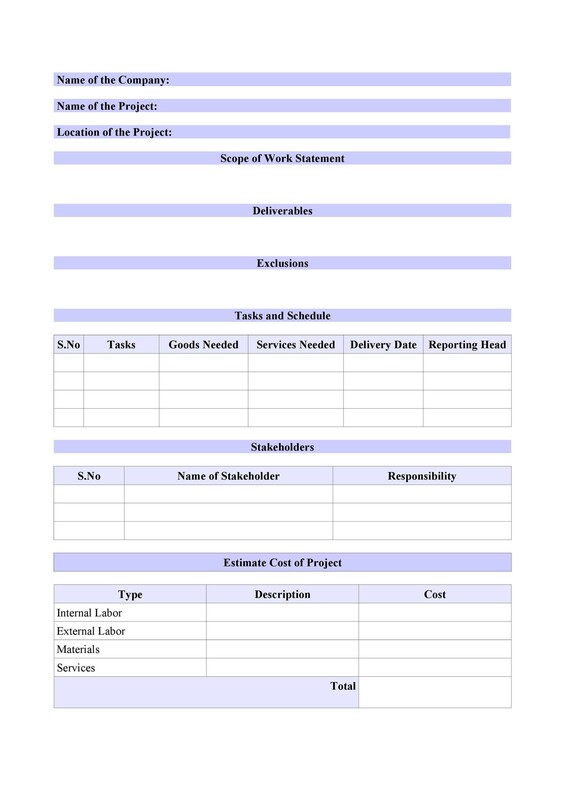 Project managers should become familiar with Scope of Work templates, which will help everyone involved in the project stay on track. 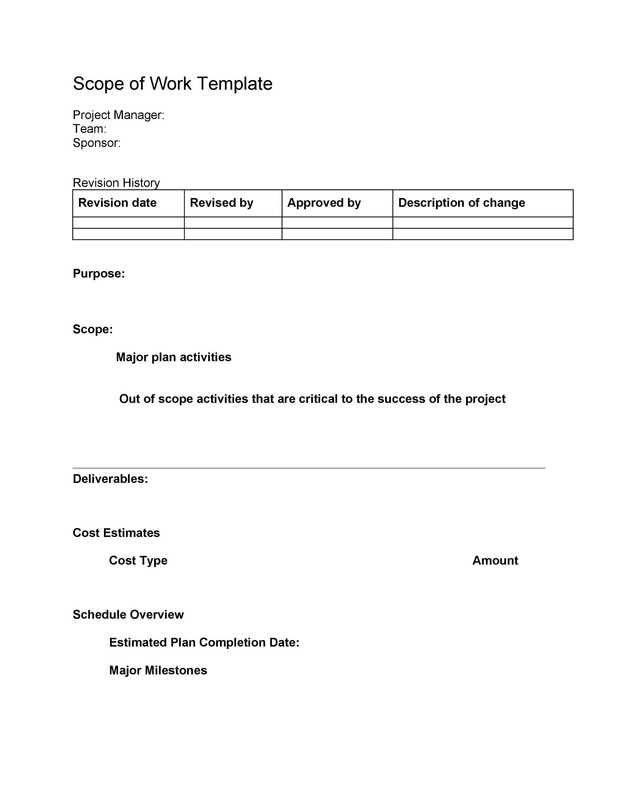 Many contractors make the mistake of using cut and paste to fill out their scope of work, simply filling in the blanks on a template. This is a huge “don’t” that you should avoid. 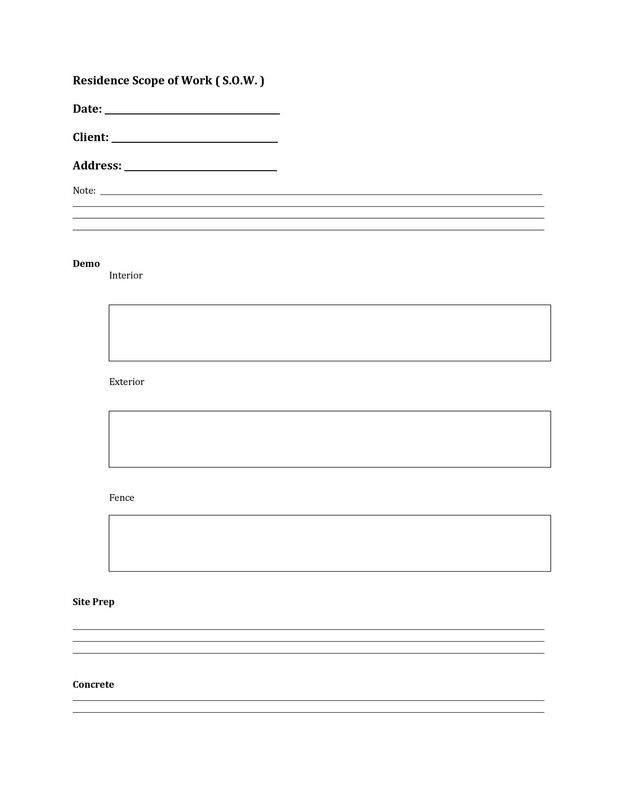 Use your SOW template to impress your clients, and make it thorough. A good Scope of Work document will reinforce to your clients that your company is the best one available for the job. It will explain specifics, such as the work to be performed, key assumptions, and price. It also serves as a legal document once the terms have been agreed upon. A scope of work document is not a proposal and should never be treated as such. It’s actually a document that’s drawn up, often immediately before you commence working. 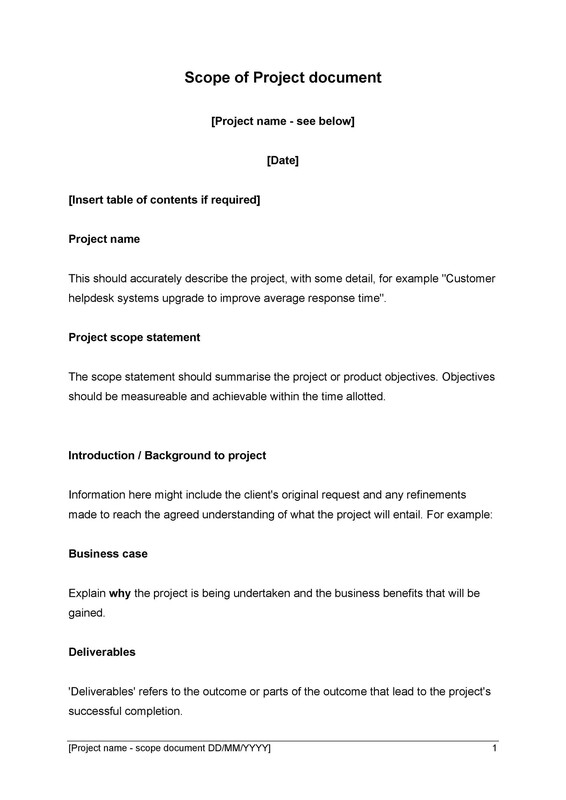 It’s usually typed up and sent to a company once the sale has been made, and includes a quote for the work that will be done, as well as a timeline for the project. Often it is sent as a follow-up once a client has made an oral agreement to work with you. What’s Contained in a Scope Of Work? Objectives: All objectives should be reasonable and measurable in terms of outcome. The objectives of the project should be discussed will in advance of this document, but the paperwork should again re-iterate your final goal. If you’re building a deck, you’ll spell out the dimensions and other important details about the final product. The objectives should answer the question “Why?” for you and your client, as well. If you’re creating a SOW for a marketing client, for example, the objective may be “to increase sales by 25% through the use of coupon promotions on Facebook and Twitter.” Whatever your objective is, it needs to be something that is realistic to achieve. 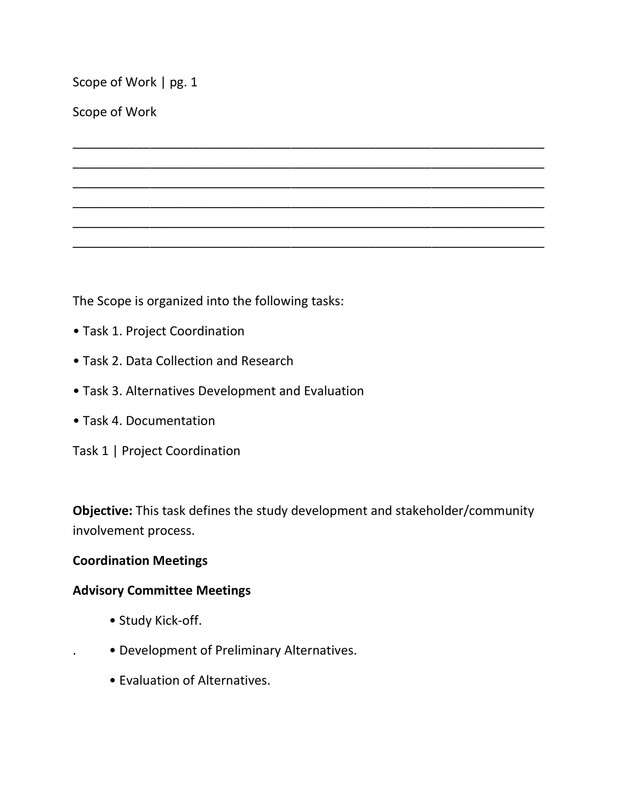 Many people include tasks within the list of deliverables. This is incorrect. Deliverables are just that…they are items that you hand off to the client for their review and approval. 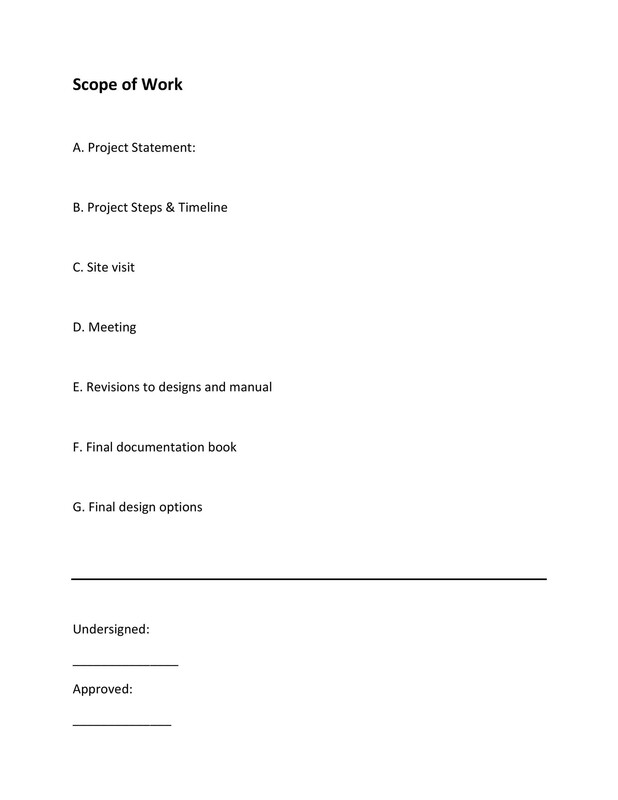 Statement or Scope of Work: This statement defines the work that will be done and the steps to completing it, as well as the deliverables, i.e. the work that will be completed and handed to the client. For example, when you’re renovating a bathroom, you don’t renovate it all at once. Instead, you will tackle each step in the most logical order, probably starting with replacing the bathtub, shower and toilet and finishing up with new tiling and grout. Each of these items will also include their own steps. 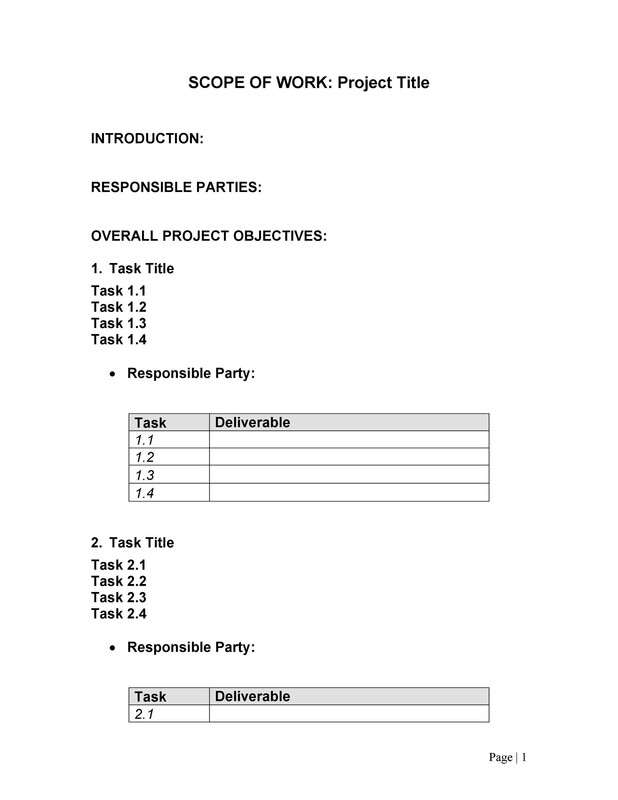 Sometimes businesses include tasks within the list of deliverables. This is not the correct way to go about writing a Scope of Work. Deliverables are the final product that you will then hand off to the client. They are tangible items that are easily accepted or rejected. It is also important to state exactly what deliverables are being created and include the details that accurately describe each deliverable. If these are goods such as products, include the size, weight, quantity and description. Do not make the mistake of giving the client options or alternatives in the scope – by the time you’re writing this document out, all of the decisions should have been made by now. The SOW should be written as a definitive statement that’s meant to “seal the deal”. Schedule: This is where you will set milestones. Dates for each project to be completed, with specifics on who will do what. If your business will involve multiple departments, you will need to coordinate to make sure the schedule is workable. Price: This will include the cost of labor, goods, and any subcontractors. If there are payment milestones required, or a deposit down, this information should be included in the SOR price section, not the schedule. The schedule applies only to deliverables. The pricing section should let your client know if they are paying a fixed fee or time and materials payment terms including a payment schedule, and the payment terms. Make sure that you specify if payments are based on a milestone or a schedule. Acceptance: This is the part of the scope of work that transforms your document into an enforceable contract. This section will include your client’s signature and the business representative’s signature. Never start a project without getting this signature. It’s more than just a formality; it will help you in the event of a dispute and serves as a legally binding contract for the courts. A well-written scope of work enables your business to get the most out of their contracts, helps build customer goodwill and earns you respect as the consummate professional. Using a Scope of Work for every project can help you establish credibility, and your clients will come to trust that your work is always transparent and fairly priced. 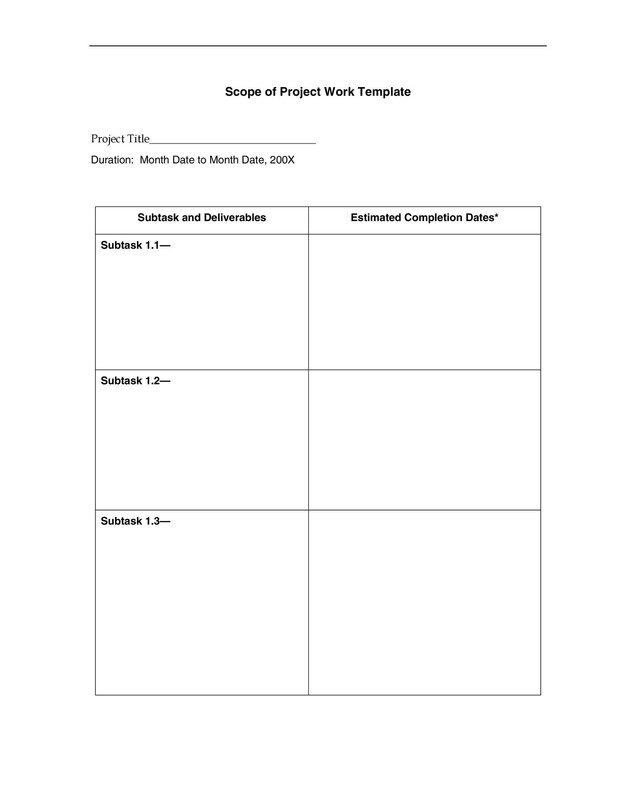 Use a template for your Scope of Work. You’ll want to adapt this template a bit to reflect the style of language your company uses. Spend time looking at a Scope of Work example. There are many of them all over the web, but you’ll want to find one that’s specific to your industry. Take the time to understand your customer’s requirements, as well as their expectations as far as project goals, deadlines, and deliverables. If you are preparing a Scope of Work for a government agency, you may need to use the information from their RFP to write a clear document. Share the information with all of your team members that will be involved in the project. Make sure to pay attention to their concerns and seek their input on any milestones or deadlines. Describe the work in clear details, and don’t leave anything out. You need to be thorough, and give complete outline of the project, as well as how the project will be deployed and managed. 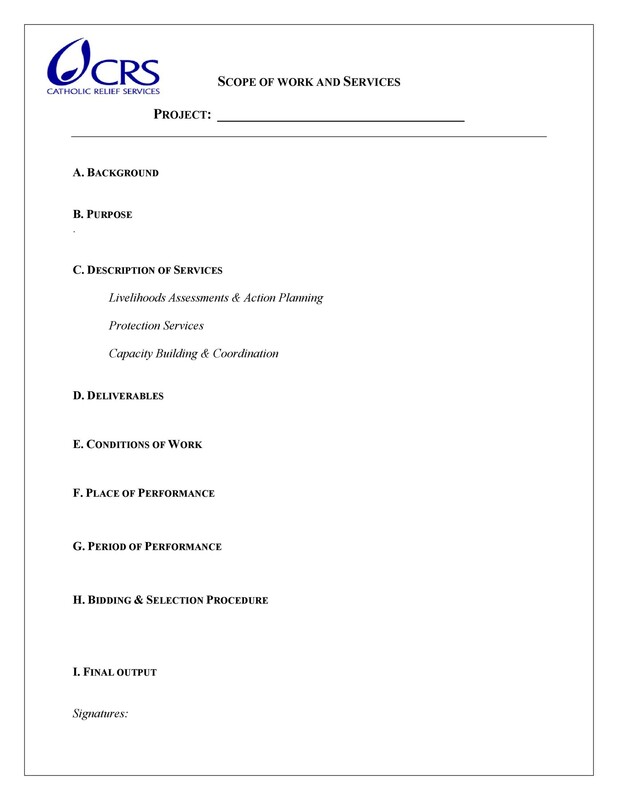 Include information on policies and procedures that may affect the project. 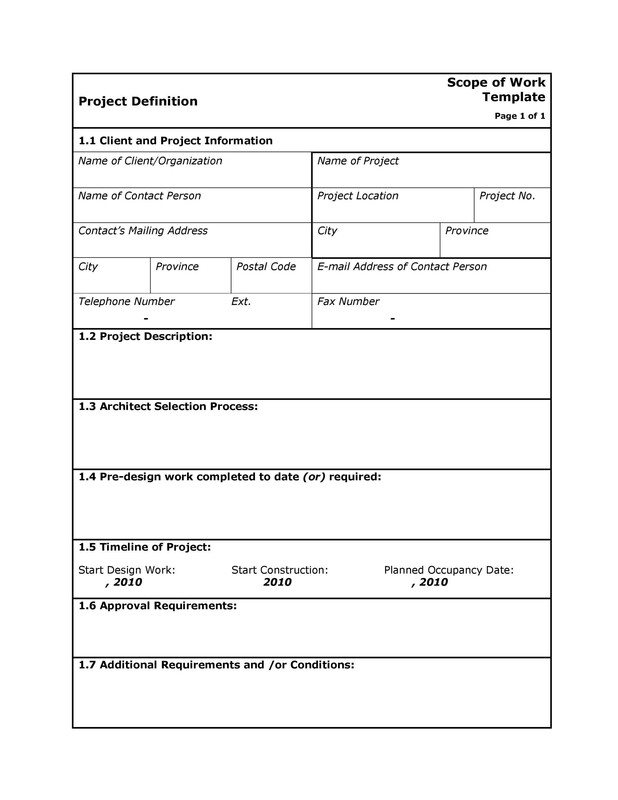 If your client is not familiar with Scope of Work documents, you may want to show them a Scope of Work example from past projects. This will help them understand why their specifications are so important, and let them know you have the capacity to handle complex projects with professionalism. Make sure to mention any technical support, warranty terms, maintenance agreements and other important terms and conditions. Make sure that if you offer a warranty, you are specific when describing what can void the warranty. What, specifically, are you going to do for this project? Make sure you include price, colors, sizes and optional add-ons. Your goals should include the entire final product, also known as deliverables. These should be tangibles such as a complete software system, a fence, etc. How will you know when the product is done? What is the total quantity of deliverables? When will you consider the project complete? This should go without saying, but don’t make any promises that you cannot keep. Be realistic about deadlines and project milestones. Make sure you can achieve what you set out to do, on time every time. Don’t add bells and whistles into this agreement, and don’t mention work that will need to be contracted out. Let the customer know what they’ll be getting, but it’s not really necessary to tell them every aspect of who does the work. Time-Based. Set deadlines, milestones, and other key dates officially. 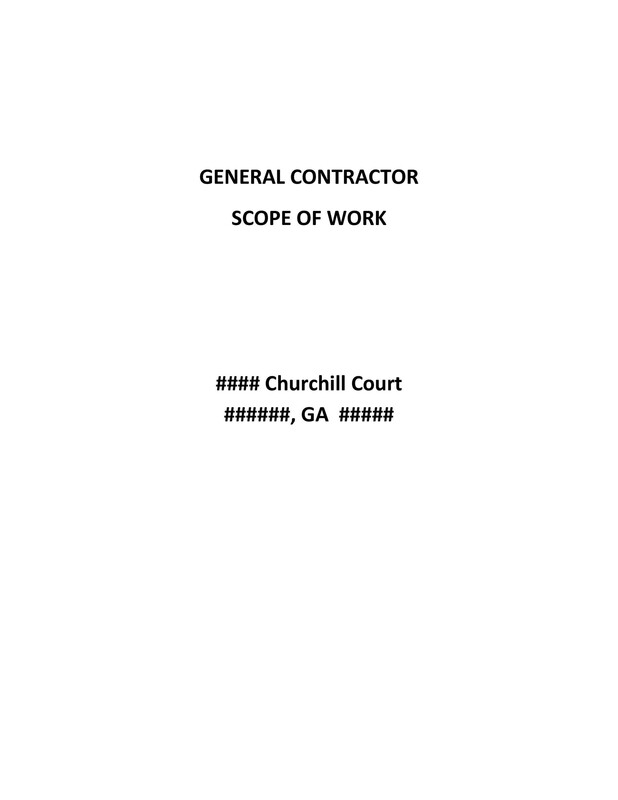 Once the Scope of Work document has been signed, it serves as a contract. Make sure these deadlines are easy for you to reach. The scope of work should contain all the information on the project you’re doing and not reference any external documents or oral agreements. All agreements that your client should concede to should be spelled out clearly in the document. 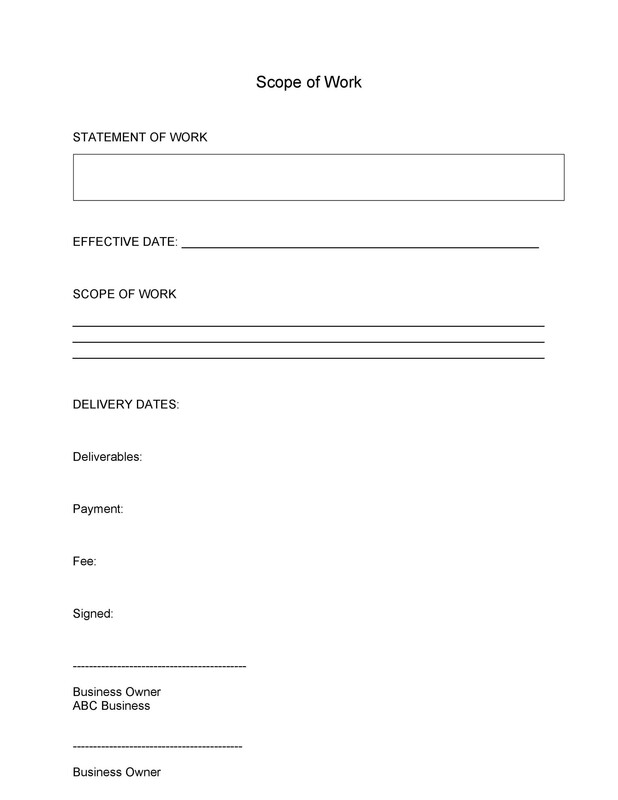 Always include the schedule and the payment terms in your scope of work document. 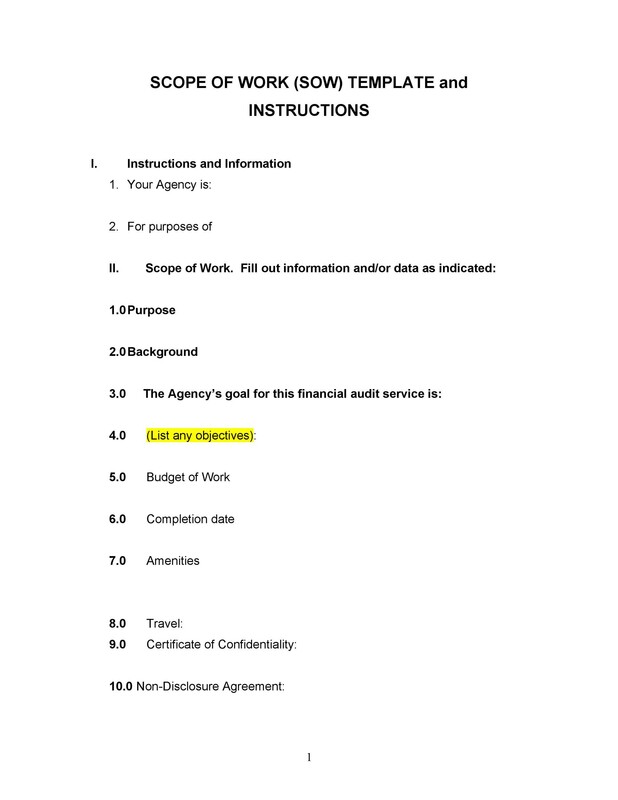 The SOW is a legal document, and referencing outside documents could lead to trouble. Instead, take your time to write out all the considerations thoroughly. If your client objects to any of them, then you will at least be able to revise the document so they are willing to sign it. Sometimes it helps to look over Scope of Work examples to get a feel for how other businesses have used the document. 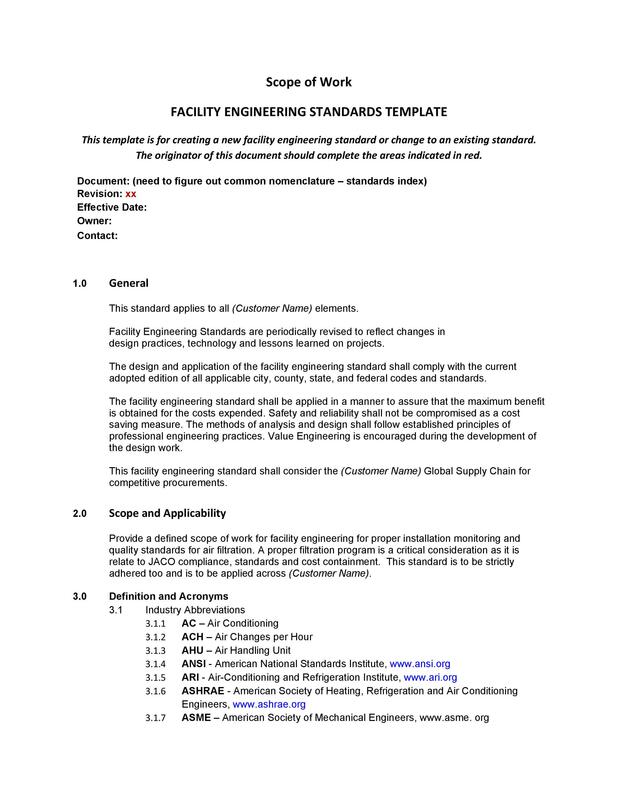 We provide you with a template as well as a Scope of Work example on this page. Take your time to look around online as well for samples that reflect the type of work you do in your industry. It will help you stay competitive and also learn about any special stipulations your competition may put in place. 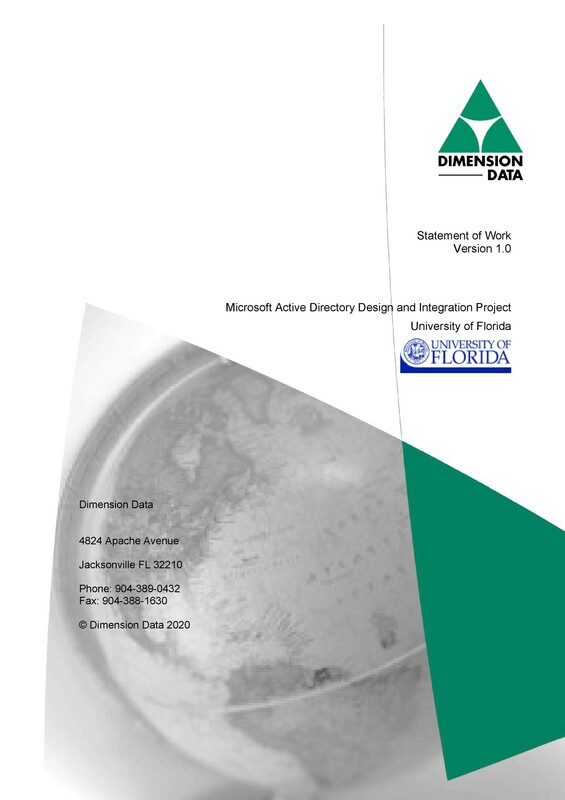 Your scope of work document should explain all the work involved and the deliverables clearly. It should be a professional, easy-to-read document. Take your time checking it for errors. Don’t rely on spelling or grammar check to find problems; those programs tend to miss a lot of mistakes. Reading the scope of work document out loud will help you discover spelling errors or poor grammar. Take time to also make sure that the numbers in the document are accurate and that the writing is specific and clear.